Once a month, my family meets at our favorite Mexican restaurant for a Saturday lunch. Mexican and/or Tex-Mex is a staple around here. Sometimes, that once a month trip isn’t enough so when I discovered this recipe I was all…YAYAYAYAY! 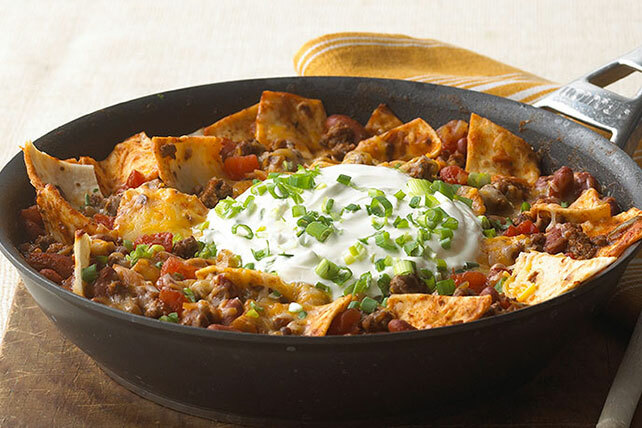 Enjoy the savory deliciousness of a beef burrito with the simplicity of a skillet dish—and do it in 30 minutes or less! Brown meat in large nonstick skillet on medium heat; drain. Return meat to skillet. Add next 4 ingredients; stir. Bring to boil; simmer on medium-low heat 5 min. Stir in tortilla pieces; top with cheese. Remove from heat; cover. Let stand 5 min. or until cheese is melted. Top with sour cream and onions. This entry was posted in Writing Life and tagged characters, food, links, new release, Nightriders MC, reading, recipe, Tuesday Treats. Bookmark the permalink. Spicy dish for a spicy book. Which was awesome, by the way. I love Shy and Digger! I did Hubs’ much-beloved salsa chicken last night with beans and rice (Uncle Ben’s, 90 seconds in the microwave) and sliced avocados. So easy and so good.